The Governor of Oregon is the head of the executive branch of Oregon's state government and serves as the commander-in-chief of the state's military forces. The title of governor was also applied to the office of Oregon's chief executive during the provisional and U.S. territorial governments. The current governor of Oregon is Kate Brown, a Democrat who took office following the resignation of Governor John Kitzhaber amid an ethics scandal. The Governor's current salary was set by the 2001 Oregon Legislature at $93,600 annually. Article V of the Oregon State Constitution sets up the legal framework of the Oregon Executive Branch. Sections 4-7 of Article V outline the formal gubernatorial election procedures such as publishing the winner, ties, disputed elections, and terms of office. Governors are elected by popular ballot and serve terms of four years, limited to two consecutive terms in office, with no limit on the number of total terms. 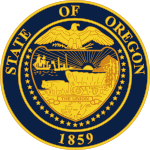 The formal process of certification of results of a gubernatorial election ends when the Secretary of State delivers the results to the Speaker of the Oregon House of Representatives. The Speaker then will publish the results to a joint session of the Oregon Legislative Assembly. Where an election results in a tie, a joint session of the next legislative session will vote on the two candidates, and declare the winner governor. Legally contested elections are also decided by the full legislature in whichever manner other laws may prescribe. Four governors have died in office, and four governors have resigned. After La Fayette Grover resigned in 1877 to become a United States Senator, Secretary of State Stephen F. Chadwick took office; he completed Grover's term and did not seek re-election. After George Chamberlain resigned in 1909 to become a United States Senator, Secretary of State Frank W. Benson took office. After Benson fell ill in 1910, he transferred his powers to President of the Senate Jay Bowerman, who was sworn in as Acting Governor. Bowerman then became governor upon Benson's resignation, and was defeated in the 1910 gubernatorial election. After the death of James Withycombe in 1919, Secretary of State Ben W. Olcott took office; he completed Withycombe's term and was defeated in the 1922 general election. After the death of Isaac L. Patterson in 1929, President of the Senate A. W. Norblad took office; he completed Patterson's term and was defeated in the 1930 Republican primary. After the death of Earl Snell in 1947, Speaker of the House John H. Hall took office; he lost a special election in 1948 and did not complete the term. After Douglas McKay resigned in 1952 to become United States Secretary of the Interior, President of the Senate Paul L. Patterson took office; he completed McKay's term and was elected in his own right in 1954. After Patterson's death in 1956, President of the Senate Elmo Smith took office; he lost a special election later that year and did not complete the term. After John Kitzhaber resigned in 2015 amid a growing ethics scandal, Secretary of State Kate Brown took office; she won a special election in 2016 and was re-elected in 2018. The governor is the commander-in-chief of the Oregon Military Department. Power is granted to the governor to mobilize and deploy state military forces. The power to grant pardons and reprieves and to commute sentences is granted to the governor, with limitations placed upon cases of treason. Additionally, the governor can remit fines and forfeitures. Any use of these powers, however, must be reported to the legislature. In treason cases, the governor may only grant reprieves. The final matter of pardons, commuting of sentencing, or further reprieves is referred to the legislature in these cases. The governor has the power to veto legislation, which can be overridden by a two-thirds majority in both houses of the legislature, and can veto particular items from an appropriations or emergency bill while leaving others intact (see line item veto). If needed, the governor may convene a special session of the legislature by proclamation and is empowered to call for special elections to fill vacant seats. Between the vacancy and special election, the governor is able to appoint a replacement. Annually, the governor addresses the legislature in his or her State of the State address. In this speech the governor outlines the current conditions of the state, and makes recommendations to the assembly as to what the government's priorities ought to be. If the legislature is out of session, the governor may appoint replacements to fill state offices until elections are held or the legislature reconvenes (see recess appointment). Mahonia Hall in Salem is the official governor's mansion. The house was built in 1924 for hops grower Thomas A. Livesley. It was named Mahonia Hall after citizens raised funds in 1988 to purchase it as Oregon's first official governors' mansion. Before the purchase of Mahonia Hall, whatever house the governor rented became the "Governor's mansion". Governors Atiyeh and McCall lived in the 1929 Stiff-Jarman House, an English cottage-style (also characterized as Arts and Crafts style) residence currently located in the North Capitol Mall Historic Redevelopment area. After the end of Atiyeh's term, the Stiff-Jarman House became the headquarters of the Oregon Department of Environmental Quality. Today the building houses rented offices. Meetings at Champoeg led up to the first constitution of the Oregon Country, and a petition for U.S. territorial status. The resulting acts also created this body as a provisional government for the region. The first executives of this government were a three-person, elected committee known as the Executive Committee. In 1845, elections for a chief executive were held. The first person in Oregon to hold the title of governor was George Abernethy, a prominent businessman. Note: These facts apply only to persons who have held the governorship under Oregon statehood. ^ a b "CSG Releases 2013 Governor Salaries". The Council of State Governments. June 25, 2013. Retrieved November 23, 2014. ^ a b c d "Constitution of Oregon: Article V, Executive Department". Oregon Blue Book. Oregon State Archives. Retrieved 2007-04-21. ^ "Temporary governor eliminated: Measure modifies line of succession". The Bend Bulletin. ^ "Governor Frank W. Benson" (PDF). Oregon State Archives. Retrieved 2017-10-26. ^ a b "James Withycombe". Oregon State Library. Archived from the original on 2006-09-23. Retrieved 2007-04-21. ^ "Architecture". State of Oregon Highway - Geo-Environmental Section. Archived from the original on 2007-05-06. Retrieved 2007-04-21. ^ "Livesley House/Mahonia Hall, Salem, Oregon 1992". Oregon Historic Photograph Collections, Salem Public Library. Retrieved January 11, 2011. ^ "George Abernethy". Oregon State Library. Archived from the original on 2006-09-23. Retrieved 2007-04-21. ^ "Notable Oregonians: Oswald West - Governor". Oregon Blue Book. Retrieved 2007-04-21. ^ "Albin Walter Norblad". Oregon State Library. Archived from the original on 2004-11-26. Retrieved 2007-04-21.